If you ask almost anybody what do in Chiang Mai, your bound to hear about elephant riding. How could you not! I mean, how cool does it sound to ride an elephant through the jungle for a day! Sounds pretty *%#*ing cool! But it’s not! It’s cruel. Elephants are very intelligent animals, and while they are used by humans, they are not domesticated. A domesticated animal has different DNA from its wild ancestors. The Asian elephants used for tourism, which were previously used for logging before the ban of logging in Thailand, have DNA that is identical to wild Asian elephants. As such, to ride an Asian elephant, they must be controlled. They are taught to submit to humans during a process called Phajaan, which roughly translates to “crushing”. Phajaan is an ancient ritual that typically lasts six days, during which a young elephant calf is separated from its mother, caged, and tied down to prevent movement. During this time, the elephant is subjected to sleep deprivation and beatings. While not all elephants are crushed in this manner, there are widespread reports of this behavior. In addition, elephants born into captivity are reportedly not subjected to crushing, though I’m sure it still happens. The true extent of how elephants are treated is difficult to uncover as these practices occur behind closed doors. Ultimately, to safely ride an elephant, it must be “crushed”. Armed with this knowledge, when we decided on spending a day with elephants we made the decision we would not be going anywhere that elephant riding is permitted. 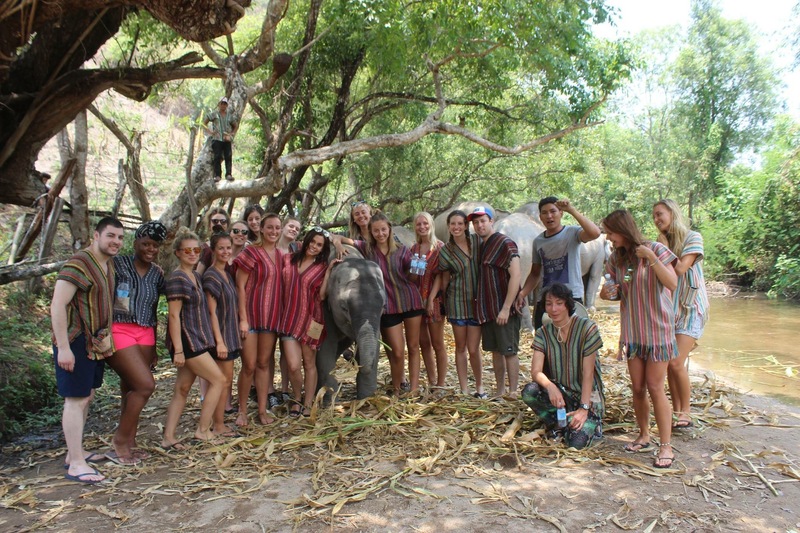 We originally planned a trip with the Elephant Nature Park, but then decided to go with the Elephant Jungle Sanctuary. Both are elephant sanctuaries and do not allow elephant riding. Their itineraries seemed very similar, as both involved feeding, swimming with, and bathing the elephants. The main difference between the two seemed to be the price and that Elephant Nature Park included a jungle walk. We also know, from various sources, that handlers have been killed by some of the elephants at Elephant Nature Park within the last few years. For a difference of over $100 USD and for our own safety, we didn’t feel it was worth it to go with Elephant Nature Park and went with the less expensive option, Elephant Jungle Sanctuary, which ended up being the right decision for us. We had a great time at the Elephant Jungle Sanctuary, where we learned about how to properly treat elephants. The elephants at Elephant Jungle Sanctuary were all rescued from camps where they were used for logging work or elephant riding. 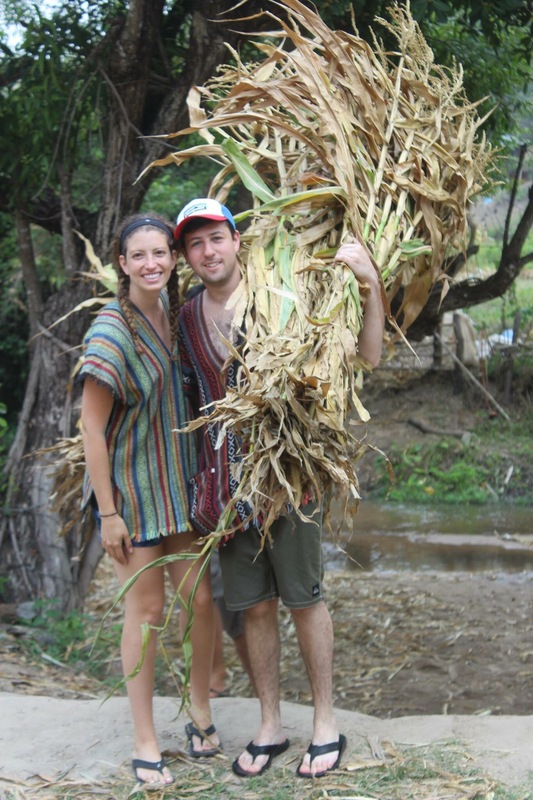 When they started four years ago, they had one camp and 5 rescued elephants. Today they have several camps and over 25 elephants! The day started at 8am, when we were picked up by the Elephant Jungle Sanctuary. As we were leaving straight for Chiang Rai after, and had arranged to be dropped at the bus station in our return to Chiang Mai, we brought our packs with us. The driver tossed our bags onto the roof, but didn’t have any way to tie them down. He swore he’s never had a bag fall off the rack, but we opted to stuff our packs under the bench seats in the back of the songthaew. We hopped up into the back of the songthaew, which had already picked up a group of six from France and began our journey south to the elephant camp. About half way through the drive we stopped at a market so the guide could buy us lunch for the day. Shortly after stopping at the market, the roads began to narrow as we began to climb winding mountain roads. After what seemed like an eternity, but was realistically an hour, of white knuckle driving on mountain roads, we turned down a dirt road that led to the elephant camp. The dirt road was full of deep ruts, was incredibly steep and windy, and had a wall on one side and a sharp drop into the valley below on the other. You just have to trust that your driver doesn’t want to fall over the edge any more than you do. When we arrived at the elephant camp, we sat on a shaded bamboo platform where we learned about the Elephant Jungle Sanctuary’s mission and the ethical treatment of elephants. Suddenly, a group of six elephants came running through the field! Our guide told us a few basic commands and we walked down into the field to feed the elephants bananas. When you yell “Bon!” the elephant lifts its trunk and opens its mouth for you to gently place the banana in its mouth. But, don’t forget how smart the elephants are! If you offer an elephant a single banana make sure you hide the bunch otherwise it will go for the whole thing! While Jess was feeding one elephant, another elephant snuck behind her and grabbed a whole bunch of bananas she was hiding behind her back! Once all the bananas we’re gone, we crossed the river and helped the mahouts carry bundles of corn for the elephants, which can eat up to 300 kilograms of food per day! After feeding the elephants, we went back up to the bamboo platform to escape the mid afternoon heat and have lunch. We were very impressed with the quality of lunch, as it’s hard to make a good meal for 18 people! The meal included fried chicken drumsticks, rice, fried tofu, an egg omelette, and rice noodle salad. 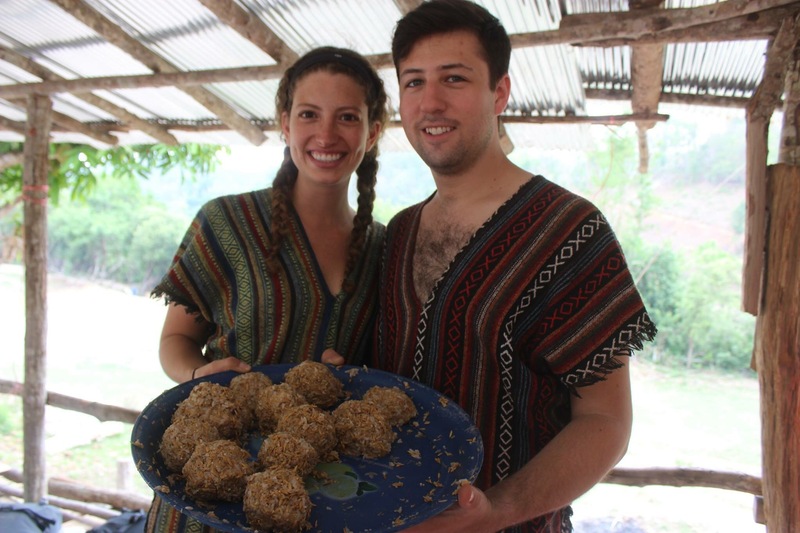 After lunch, we made some “medicine” for the elephants, which included raw rice, cooked rice, bananas, and tamarind. It was mushed up into balls and we fed them to the elephants to ensure they got plenty of nutrition. Next, it was time for the mud spa! The guide instructed us to change into bathing suits and leave our shoes behind!We brought the elephants to a mud pit towards the side of the field and wallowed in the mud with the elephants! After about a half hour of helping the elephants cover themselves in the mud, the elephants got up and ran towards the river to wash off. 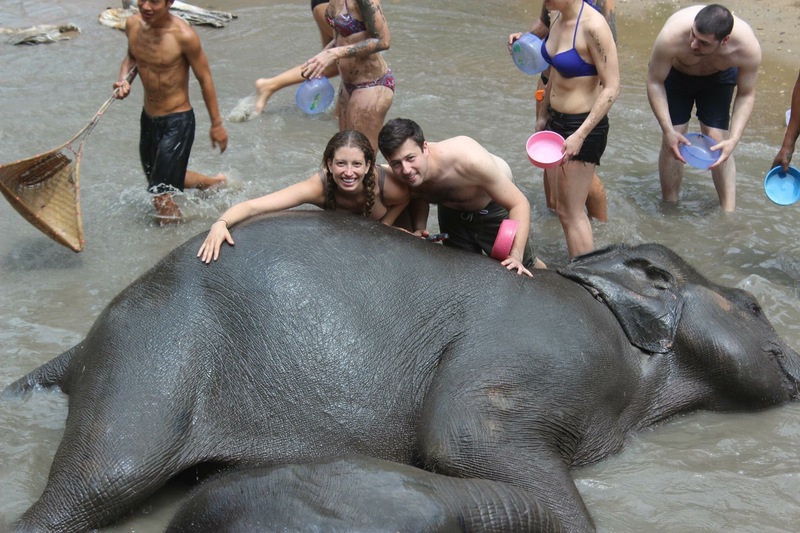 We helped wash the elephants, and then swam in a pool a bit further upstream to wash off. After the elephant baths, we fed the elephants some more corn. By now it was nearing 4 o’clock and everybody seemed ready to head back to Chiang Mai. Since we had a bus to catch, we took advantage of the one shower they had next to the bathrooms at the elephant camp. We then hopped back into the songthaew for another white-knuckle ride back to Chiang Mai. Following an amazing day feeding, bathing, and playing with elephants, the Elephant Jungle Sanctuary made sure to get us back to Chiang Mai in time to catch our bus to Chiang Rai. Next PostTrack 2, Car 5, Seats 39 and 40. Bangkok to Chiang Mai.